Summer has at last arrived. My husband and I have been discussing where to take the kids on vacation for the last couple of days. We both know that picking a vacation spot also means spending time doing research to find out about accessibility for any trip we're considering. However, we have learned that it does not matter how much research we do because once we arrive at the destination, it may not be as accessible as was expressed to us by phone. For instance, one hotel described their bathroom as having grip bars, a shower chair, and an accessible shower. When we got there, there were no grip bars, the shower chair was not stable, and the shower was definitely not accessible. But setbacks like these don't stop my family and I from venturing out of our comfort zone to find new vacation destinations and ideas. Last Labor Day weekend we’d planned a family trip to San Antonio, Texas. My cousin had suggested that instead of staying at a hotel in which the kids would be cooped up, we stay at the KOA (Kampgrounds of America) campsite. I had never heard of the KOA campsite and was weary about the idea of the bathroom being in a separate building than our cabin. Nonetheless, we gave the idea of camping a try! We got to the cabin at 11 pm; we were greeted at the gate and given a code for the bathroom. The man in charge explained that the bathroom code was strictly for the handicap bathroom and we were not to give it out to anyone. I asked why they kept a code for the handicap bathroom and was told this was their way of maintaining the bathroom for their disabled guests. We drove to our cabin, which on the outside looked small but the first thing I noticed was the wheelchair ramp that led to the porch of the cabin. We opened the door and noticed the two rooms inside. The first room had a queen size bed and the second room had two sets of bunk beds. Everything the cabin had inside was accessible, the shelves, bed, light switches, and outlets were all lowered and within reach of a wheelchair user. Then I hear my husband, daughter and her friend ask where the television was, which was one of the funniest parts of our trip because they were very dramatic and couldn't understand a world in which T.V. didn't exist. I assured them they would make it through the week just fine with all the activities and fun we’d planned. We all set about making our living quarters livable with putting sheets and blankets on the beds, unpacking our vehicles and, in an hour, we were done and ready to call it a day. The next morning we woke up with ducks at our door. The kids were thrilled to feed the ducks. I was still in bed, therefore the girls thought they’d get the ducks to come into our cabin with bread and Cheetos so that I could see them. Shortly thereafter, my husband and I grabbed our shower things, clothes for the day, and headed for the bathroom. We used the code to open the door and were absolutely amazed at how big and accessible it was. The shower was wheelchair accessible, had a shower chair built into the shower which you could fold up or leave down if you were using it. The bathroom also had hand rails, and the sink and mirror were both at level in which I could use. We spent the first day lounging around the campsite, watching the kids as they rode the bikes (campgrounds provided bikes), and swimming. We decided to go grab dinner on the river walk that night; we parked in the parking garage and headed on our way. We were frustrated at first because we could only find stairs leading to the river walk. My cousin then stepped into a restaurant and asked where the accessible entrance was, at which point we were directed to a building with an elevator. My husband and I told our family we’d meet them downstairs, and we headed towards the elevator. When the doors opened, we were captivated by the beauty and excitement the river walk offers! We had dinner and walked/rolled along the sidewalk. It was a very beautiful, fun, unforgettable night! around the campgrounds at night. Being at the campgrounds was the first vacation I’d been on that made me feel included with my family in every aspect. The cabin itself, the bathroom, and the overall accessibility of the grounds were absolutely wonderful! 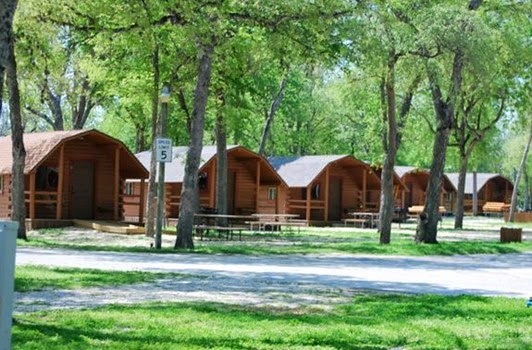 While we are contemplating our next vacation spot, my first choice would be going back to the KOA campgrounds (which are located throughout the United States). However, as the saying goes, “Nothing ventured nothing gained,” which to me means that there are a lot more adventures for us to have, and so if we keep going to one place, we could miss out on a world full of accessible vacations! Oh and in case you’re wondering, my family made it through the vacation without the television, in fact once we returned home, a TV wasn't turned on for the first two days! To find a campsite for your next trip, visit http://koa.com. When Rebecca Sanchez was an infant, her family was involved in a car accident that took the lives of her mother and stepfather. Rebecca was left with a spinal cord injury for life. She and her brother were raised by their grandparents. Rebecca's grandma was her number one fan who taught her to live life independently. She would always tell Rebecca, “You have two perfectly good arms and a brain. Figure it out!” Rebecca once asked her Grandma why she told her this and her response was, "The world’s not going to be accessible for you, so you have to learn to overcome obstacles." Rebecca is happy she taught her this very valuable lesson early in life. In 2001 Rebecca met her husband. Two years later their daughter was born. Having a daughter was a blessing for them as the doctors told Rebecca many times that she would not be able have a child. Her daughter is her greatest accomplishment. After having her daughter Rebecca went back to college and earned an Associate’s degree in criminal justice. Rebecca has served on both her city and states disability advisory board and enjoys advocating for people with disabilities. She currently works as a substitute teacher, which she loves very much. When she is not busy working, Rebecca enjoys spending time with her family, two dogs, writing, traveling, and living life to the fullest. When buying replica handbags you check, choose a handbag that looks close to the gucci replica original as much as possible. Put money in these types of projects is not bad just because a replica handbag. Buy a copy of the key is to find a bag similar to a real project as possible. That is why it is external materials and details of the design is important to replica handbags check carefully handbags, buying replica handbags. If the design of fabrics and details look almost like the real model, then it may be high quality. Followed by feedback, remember you buy any copy items from previous inspection or search for louis vuitton replica customer feedback site reviews to see what other people have any questions, dealing with specific online store from an online store. To avoid being cheated, check your online store is legitimate, and check service. Finally, be aware of the sales price of the item. A standard replica handbags should only cost you about $ 150 to $ 250. Be careful when a website to sell your handbag more than 300 U.S. dollars, because it is expensive. On the other hand, if its price below $ 100 a closer look, especially the construction quality handbag designs. Always remember, if the price is really cheap, the gucci replica quality is cheap. So you should have a good understanding of the current cost of replica handbags or ask at least one friend to help you find quality handbags.